Katie Baker is a native of Anne Arundel County and currently lives in Crofton with her husband, Eric, and their two children, Rachel and Mark. Katie joined Down Syndrome Connection of Anne Arundel County as a parent member in September of 2017 after the birth of her son who was born with Down syndrome. Her involvement in the organization as a member of the Steering Committee and Medical/Community outreach developed out of a passion for education and advocacy. Katie is a physician assistant who has been in practice since 2014. She started her career in neuroscience, working first in outpatient Neurology and then in Neurosurgery. She recently began a position in Women's Health. By sharing her experience as a parent of a child with Down syndrome from prenatal diagnosis onward, Katie hopes to educate the community and medical providers about the joys and challenges that families and individuals with Down syndrome experience to foster a more inclusive, accepting society that views individuals living with Down syndrome as the important, contributing members of their communities that they are. Lauren Ochalek was born and raised in Baltimore, MD. 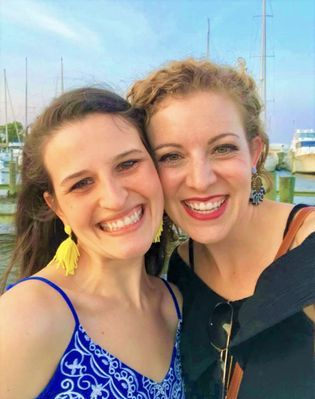 After living away from MD for a decade while her husband, Aaron, a Navy pilot, was on active duty, Lauren and her family moved "home" to Severna Park, MD where they became involved in Down Syndrome Connection of Anne Arundel County. Lauren's passion for Down syndrome education and advocacy began, unknowingly, long before 2012 when her daughter, Ellie, was born with Down syndrome. Growing up alongside a dear friend, Julie, who just so happens to have Down syndrome, truly shaped Lauren's life, motivating her to choose a career in pediatric nursing. Her nursing colleagues would tell you that her favorite patients were always those with Ds. In 2011, Lauren completed a master's degree in nursing education, at which point she not only began a career in teaching nursing but also became involved in medical outreach and education within the Down syndrome community. Today, Lauren plays an active role on the DSC Steering Committee and oversees Medical and Community Outreach. Lauren's heart beats at the opportunity to promote Down syndrome awareness and acceptance, promote advocacy and inclusion, and educate both medical providers and the community on all things Down syndrome. When she's not volunteering her time with DSC, Lauren enjoys traveling, design, photography, gardening, kayaking, spending time with family and friends, and chasing her three young children (Ellie, Cameron, and Amelia). We highly encourage all new parents to print 2 copies of these Down syndrome specific healthcare guidelines from the American Academy of Pediatrics. One copy to provide to you, the medical provider, and one for them to keep with their child's healthcare records. The easy to follow guide will make your care of a patient with Ds that much more manageable and will ensure that everyone is on the same page. Diagnosis to Delivery: A Pregnant Mother's Guide to Down Syndrome"
"How To Deliver a Down Syndrome Diagnosis … Better"
"When Delivering a Down Syndrome Diagnosis: First, Do No Harm"
"To the Doctor Who Delivered My Son's Down Syndrome Diagnosis: You Could Have Done Better"
"Dear Doctor, You Told Us Our Daughter Would Be A Vegetable. Really?"